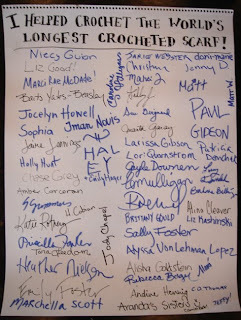 The Longest Crocheted Scarf and A Visit from Frau Fiber! 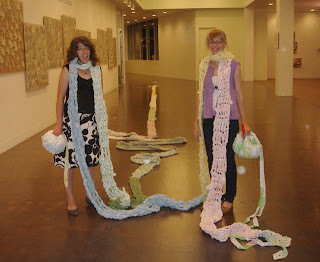 Jaime and Amber were at the Denver Art Museum's monthly Untitled event friday night teaching museum goers some crochet skills as we crocheted the longest crocheted scarf in the world. 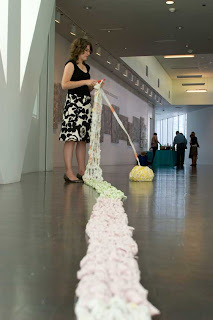 Our scarf is currently at 115 ft! Museum photos by Christina Jackson. 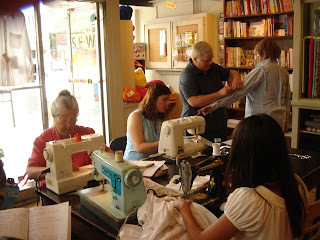 Today Frau Fiber held a free workshop in the store and taught shoppers about alterations and making patterns from existing garments. Super fun! 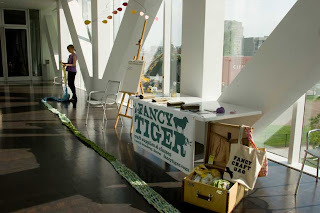 Frau Fiber's students left Fancy Tiger looking super cute. 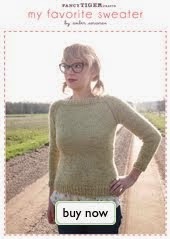 We have lots of new cotton yarns in - perfect for knitting a sleeveless cardigan for warm summer evenings! 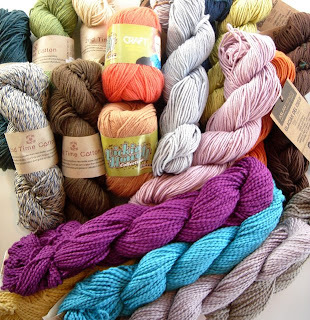 Check out cotton yarns such as Luna by Cascade yarns, 2nd Time Cotton - an eco-friendly recycled cotton yarn that uses cotton salvaged from apparel industry waste, and a silky cotton from Aslan Trends. 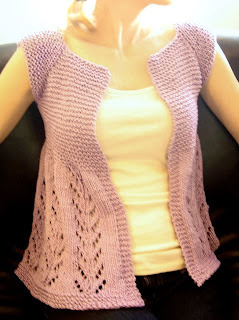 Cardigan shown is the Juliet pattern in Luna. We had a super fun time at the Estes Park Wool Festival this weekend, drooling over lovely yarns and rovings and petting super cute animals. 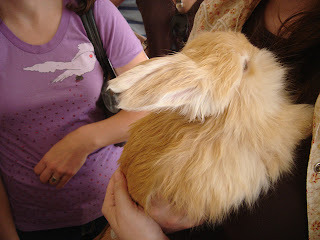 We fell deeply in love with a baby angora rabbit, which we named Apricot and nearly, just nearly, brought home with us. What do you think of a fluffy Fancy Tiger store mascot to pet and hug while you shop? Oh, Apricot, you little fawn furrball, why didn't we take you home with us?! 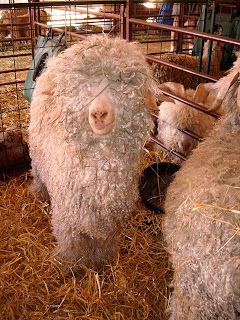 We met sweet angora goats whose eyes disappeared under all their shining mohair locks. 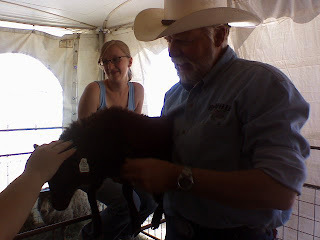 And our dear friends, Peg and Woody from Pinon Wood Ranch, let us cuddle their baby Shetland sheep, Hershey Kiss. 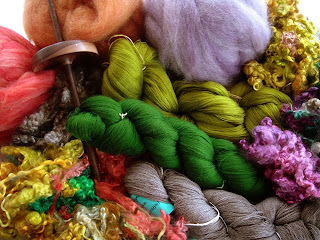 We brought home tons of goodies, including naturally dyed rovings from Handspun by Stefania, some amazing lace weight yarn from Skaska, a beautiful walnut drop spindle from Magpie Woodworks, and pretty, pretty mohair locks from Kai Ranch. Yummy! 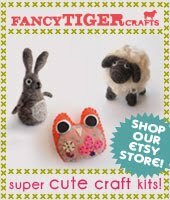 Fancy Tiger has tons of new adorable vintage fabrics! 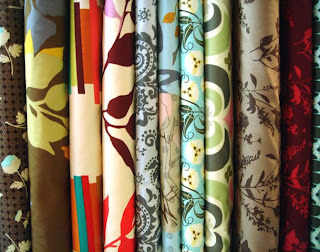 Now for sale at Fancy Tiger and in limited quantities, we have some lovely vintage ginghams and flocked vintage fabrics. That's right--flocked. 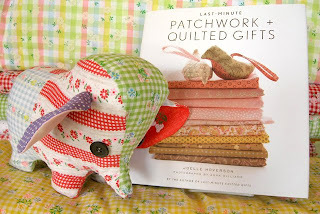 Available by the yard and in cute scrap stacks for patchwork projects. 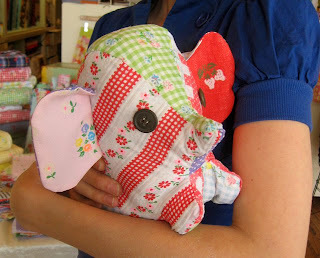 Come by and see Peanuts, our vintage fabric spokesperson and cuddle master extraordinaire! 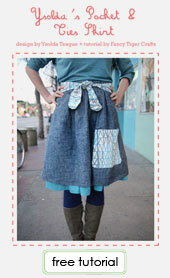 We've been sewing up skirts like crazy at Fancy Tiger lately. 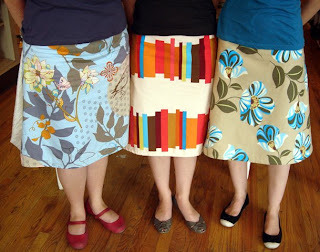 These three pretty skirts were made with Amy Butler's Barcelona Skirt pattern in prints by Anna Maria Horner and Amy Butler. 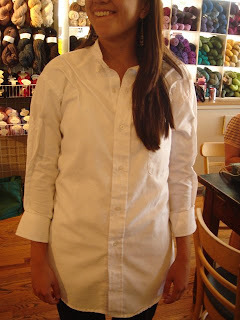 The simple A-line Skirt is easy enough for a beginner and quick enough to make in a few hours. I'd like to make one for every day of the week! We've got some gorgeous new sock yarn in to keep you knitting all summer! 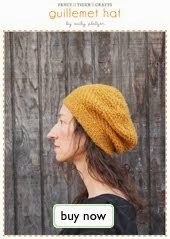 First - the Rio De La Plata sock yarn - beautiful variegated plys. Second - Noro sock yarn is finally here! Knit your own self-striping socks in super-hot colors!